All three of the ancient church buildings in the Benefice have tales to tell that span more than a thousand years. They are all part of Canterbury's rich heritage and some feature in important historical events in England's turbulent past. Here are a few headlines relating to our three Churches. St Dunstan's Church in Canterbury has been a place of worship and pilgrimage for more than 800 years. The church’s patron saint is Dunstan, a former Archbishop of Canterbury and who many consider to be one of England’s greatest saints. St Dunstan’s Church attracts visitors and pilgrims from around the world due to two significant, historical events. The first one followed the murder in 1170 of Thomas Becket, who was Archbishop of Canterbury at that time. He was killed in Canterbury Cathedral by four knights, who were loyal to King Henry II. They were prompted to murder Becket after overhearing King Henry cursing Becket with the famous words, 'Who will rid me of this turbulent priest?' Mortified by what had happened, the king came to Canterbury in an act of public penance for the Archbishop’s death. He arrived from London on 12 July 1174 and stopped at St Dunstan’s Church, just short of the ancient city wall. It was in the church that the king started his public act of penance. He exchanged his regal robes for a sackcloth shirt and went from here on his knees to Canterbury Cathedral to undertake further acts of penance. The second event followed the execution of Sir (later St.) Thomas More, the Lord High Chancellor of England from October 1529 to 16 May 1532, in the reign of King Henry VIII. Sir Thomas More opposed the Protestant Reformation and King Henry’s separation from the Catholic Church. Sir Thomas More refused to acknowledge the king as Supreme Head of the Church of England and the annulment of his marriage to Catherine of Aragon. After refusing to take the Oath of Supremacy, he was convicted of treason and beheaded. His head was placed on a pike on London Bridge. More’s daughter, Margaret Roper, who lived almost opposite St Dunstan's Church, rescued her father’s head from London Bridge and brought it to Canterbury. It was interred in a crypt within St Dunstan's church, in the Roper Chapel, where it safely resides to this day. Because of these strong historical connections and today's mission of witness, the Rector and PCC of St Dunstan with Holy Cross consider it a crucial centre for pilgrims and tourists alike. This ancient church, just inside the City Walls and close to the Castle, is one of the oldest in Canterbury, dating back to around the 11th century although the exact date is unknown. 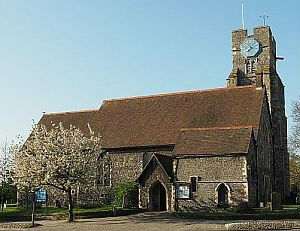 It is certainly the first church in England to be dedicated to St Mildred. She was the grand-daughter of King Penda of Mercia and abbess of Minster-in-Thanet, who died in about 722 AD. There are still some traces of the late Saxon period in the South and West external walls. The north-west porch, which is the main entrance to the church, has a fine pair of Tudor external doors. Over the inside doors is a board, listing benefactions and charities. To the left can be seen the Royal Arms of King George III. Close to the doors is the font, which dates from the 15th century. Its wooden cover is of the same date and, when required, is raised by a chain and counterweight. There are some interesting ledger stones in the floor of the nave and several memorial tablets on the walls which are worth a look. The most notable is by the pulpit – to the memory of Thomas Cranmer, son of the Archbishop’s brother Edmund, Archdeacon of Canterbury. The rood beam between the nave and chancel is modern and shows the usual Crucifix and supporting figures of Our Lady and St. John. Most of the chancel furniture is also modern, but the bench ends are thought to have come from a little church known as St John the Poor which stood nearby. The only brass memorial in the church is on the wall behind the choir stall on the north side of the chancel. It is dated 1621 and shows the heraldic arms of Edward Nethersole impaling those of his wife, Dorothy Selwin of Friston in Sussex. To the south of the chancel is a chapel now dedicated to All Saints. It was built in 1512 as the burial chapel of Thomas Attwood and his family, who lived in Stour Street. Thomas Attwood was four times Mayor of Canterbury. The rare fireplace has an original hearth and fireback although the bob grate was added in the 18th century, when the use of coal instead of wood became customary. The window to the left of the fireplace contains a 15th century figure of St Mildred. The chapel’s external walls show some fine Tudor chequerboard stonework and the unusual feature of an inset cross on the west wall. The parish possesses some fine altar plate, including a chalice of 1622 given by Anthony, husband of Thomasina Honeywood; a silver alms dish given by Sir Francis Head and two flagons dated 1765. These are now kept in the Treasury at the Cathedral. Also at the Cathedral for safe keeping are the parish registers which began in 1558. The marriage of Isaac Walton, author of ‘The Compleat Angler’, was recorded on 17 December 1626. See also Friends of St Mildred and their information sheet therein and the Canterbury Archaeology site. The church is thought to stand on the site of a church built for the local Christian community in Roman times. It was rebuilt on its original site, which is just off the main street in Canterbury. It was rebuilt by St Augustine and his monks in Anglo-Saxon days. Evidence of its early origins can be seen in the tower, which incorporates Roman tiles, and Anglo-Saxon quoins or cornerstones. The tower in its present form dates from c.1100 and houses four ancient bells, cast between c. 1325 and c. 1599. In 1448, King Henry VI established the Mayoralty of Canterbury, from which date all the names of the Mayoralty are recorded. The Mayor-making service was held in St Peter's church where, from 1660, the rest for the mayoral mace and sword can be seen. Many of the City's past mayors are buried inside the church as well as in the churchyard. Parish registers begin on 9 September 1590. By the middle of the 1600s, the parish of St Peter's was home to many Huguenot and Walloon refugees. They had fled their countries to escape religious persecution. Inside the church on the north wall is a brass commemorating these settlers, who were buried in the churchyard. In 1681, St Peter's was united with the adjoining parish of Holy Cross. This connection only ended in 1959. Until 1910, there was a close association with St Augustine’s Missionary College and services were undertaken by Warden Maclear, the Fellows and students. Unfortunately, in 1926, services were suspended and the church was gradually denuded of most of its furnishings, including the organ. In 1953, Sunday services were reintroduced. Six years later, with the reorganisation of the parishes and a new Rector, St Peter's was once again restored to its full life. In 1974 the parish of St Peter and St Alphege, with St Margaret, and St Mildred with St Mary de Castro was formed. In 2017, the Benefice of St Dunstan, St Mildred and St Peter was created.